We felt pretty much the same way about this one, Keertana! I thought it was exciting, too. The pacing was a bit uneven, but that's the only flaw I can remember. Other than that, I really must applaud Schwab for her extraordinary imagination and the willingness to push us to territories unexplored. Wonderful review as usual! 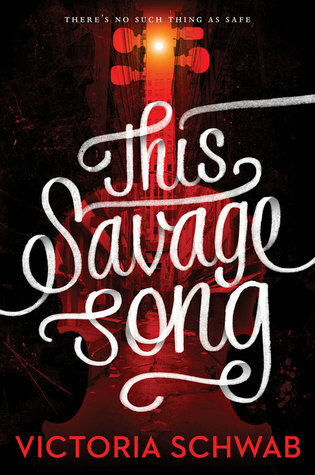 VE Schwab knows how to keep us on our toes, for sure. I haven't read my copy yet, but I'm dying to. I've started a few books and I don't want to add another one. I can't wait to discover it for myself! Fantastic review, Keertana! I need to read all of this author's work, but as for this one in particular, I NEED IT! It sounds so amazing and I love that it has such an important "message" attached to it as well. I like how you said it was paranormal and therefore, NOT real, but it FELT real, and that's all that matters sometimes. LOl so much fun to see taht you had a great time with the story. Love your enthousiasm about it! I agree! I enjoyed this one and it really did feel like she wanted us to think about the violence we participate and perpetuate. I really want to read more of her work now. I think this was my first book by her. Not my last. Brilly review!! This sounds Fabulous! I can't wait to get my hands on a copy! Ohh great review! I've been wanting to get my hands on this book for a long time since I first heard about it a few months ago. I heard nothing but great things about it and I am very intrigued about the plot aspect of this book. Thank you for your awesome post.